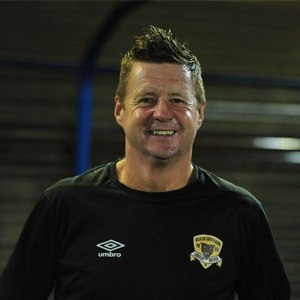 Cape Town - Black Leopards coach Dylan Kerr has denied the club has signed Bokang Tlhone and insists survival is the ultimate goal. Recent reports have suggested the player has penned a deal with Lidoda Duvha, however, it appears this is not the case. Kerr insists that he knows nothing about any new additions to his squad and emphasised that avoiding relegation in 2018/19 is the priority. Tlhone was released earlier this year from his contract with Maritzburg United. He said: "Which new player? We haven't signed him. He's trained twice, but nobody is going to sign. We've made ourselves clear about that until we either are in the NFD or PSL until we're mathematically safe in the PSL nobody will be signing with this club. "I've just arrived back from the UK, to find out that he was signed...apparently we signed this player, and as far as I'm concerned we've signed nobody. "We haven't signed anybody. I spoke to the management. He is here for me to have a look at him you know, again nothing has been decided until we know we are guaranteed of either staying in the PSL or being involved in the play-offs or relegated, which is not in our mindsets. "Our mindset is to finish as best as we can in our remaining games. We trained yesterday, but you can't assess anybody in one training session."